Between the Wolf and the Dog | DogJudging® - Il mondo della letteratura cinofila. When performing archeological dig in the upper palaeolithic settlement called Eliseyevichi 1 in the Bryansk Region, Mikhail Sablin, Zoological Institute, Russian Academy of Sciences, and Gennady Khlopachev, Museum of Anthropology and Ethnography, Russian Academy of Sciences (St. Petersburg), found two intact dogs’ skulls. 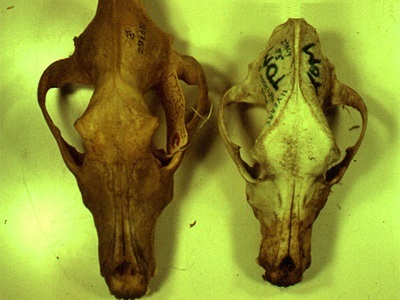 These are apparently the most ancient dogs’ skulls known to researchers: they date back to 13 through 17 thousand years. The research has been financed via the Russian Foundation for Basic Research. The dog was the first animal domesticated by human beings. However, domestication took more than one step: people and dogs used to adjust to each other within numerous generations of coexistence. Biochemical and genetic researches have proved quite definitely that the dog’s ancestor was the big predatory wolf, but not its smaller relative – the omnivorous jackal. However, it is impossible to determine when human beings first domesticated the wolves, as their domestication could not be recorded in archeological materials. Only when primitive dogs started to reliably differ from their wild ancestors, it became possible to distinguish their bones from wolf’s remains. Not long ago a group of American geneticists (Vila et al. 1997) came forward with an assertion that the wolf domestication began more than 100 thousand years ago, nevertheless, palaeontologists and archaeologists feel skeptical about such dating. Even the most ancient dogs’ remains date back to the paleolith, their age making about 14 thousand years; while their mass findings belong to the mesolite, which began in Europe approximately 10 thousand years ago. However, the overwhelming majority of finds are more ancient than 12 thousand years – they are primarily minor bone fragments that can tell little about the owner’s life. In this context, the discovery of two intact dogs’ skulls in the course of archeological dig in Eliseyevichi 1 settlement is of undoubted interest. The dogs from Eliseyevichi 1 had lived in severe conditions of the ice age: their bones lie next to those of the mammoth, polar fox and reindeer. Their exterior reminded that of enormously big huskies, Tibetan mastiffs or Caucasian sheep dogs: their height at withers was as much as 70 centimeters! They were shorter and wider in the muzzle, than the contemporary huskies, this particular feature enabling to reliably distinguish the primitive dogs from wild wolves. The dog’s short and wide muzzle apparently results from the so-called neoteny, i.e. adult individuals preserving features of the young. A similar process took place in the course of the human being’s evolution: the flat face in contrast to the elongated muzzle of a chimpanzee or gorilla is the obvious indication of neoteny. On the other hand, ancient people used often the dogs for cooking purposes. The sinciput of one of the skulls bears distinctive holes evidently made for extraction of the dog’s brain for culinary purposes. Dogs’ skulls with similar injuries can be often found in the settlements dating back to the late Stone Age and the Bronze Age, however this is the first evidence of such kind dating back to the upper palaeolith. Evidently it was then, in the age of the upper palaeolith, that the conditions were established for the primitives and the wolves hunting for the same animals. This laid a good foundation for their symbiosis, i.e. mutually beneficial relations. The more so, as the social structure and some peculiarities of both species’ behavior are rather similar. In ancient era the dog played a key role in improving human beings’ hunting skills, and therefore, in establishing primeval engineering and culture.